Using this feature of the Download Manager Plugin allows you to monitor who is downloading your files and also keep them for members only. 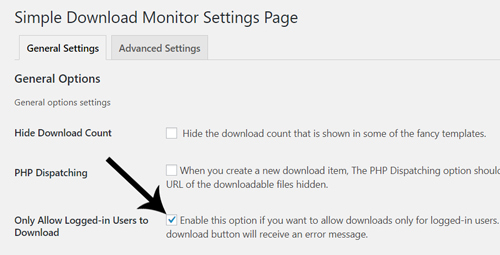 Ensure you have the Download Manager Plugin installed and activated on your site. Click on Settings under the Downloads menu. Mark the checkbox next to Only Allow Logged-in Users to Download. Now your users must be logged in to be able to download your files. When a member is logged in and proceeds to download an item, their membership username is recorded. These records can be found by clicking on Logs menu under Downloads. Under the Title column is where you can see which item was download and under the Username column is where you can see who downloaded it. This way you can track what content your members are downloading.